A Dutch historian has gone viral on social media after accusing the wealthy attendees of the World Economic Forum of hypocrisy, and arguing they should be taxed more. The forum, held in Davos, Switzerland, is attended by world leaders and heads of business, who come together annually to discuss ways to improve global economic security. 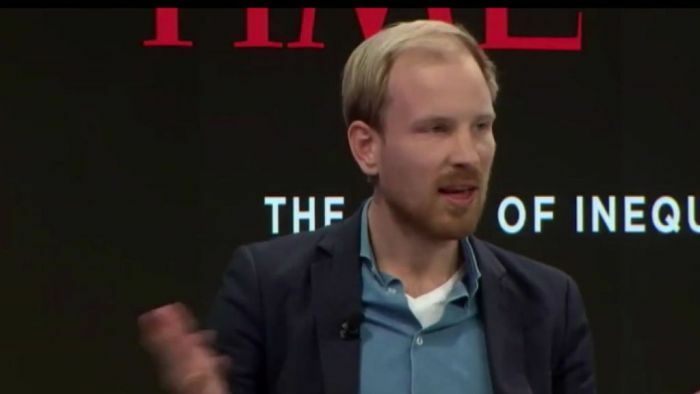 Historian Rutger Bregman was speaking on a panel about taxes, and questioned billionaire attendees’ use of fuel-guzzling private jets to come to a conference with a strong focus on tackling climate change. “This is my first time at Davos and I find it quite a bewildering experience to be honest,” he said. “I mean, 1,500 private jets flown in to hear David Attenborough speak about how we’re wrecking the planet. “But then almost no-one raises the real issue of tax avoidance, right, and of the rich just not paying their fair share. The video of Mr Bregman’s comments showed the historian and author speaking on TIME’s panel on inequality. The panel was discussing an Oxfam report which revealed 26 billionaires had the same wealth as the world’s poorest 3.8 billion people combined, and was asked whether this inequality was likely to lead to a backlash. Mr Bregman said industry had to “stop talking about philanthropy and start talking about taxes”, citing the high tax rate of 1950s America as a rebuttal against the argument that economies with high personal taxation could not succeed. “Ten years ago the WEF asked the question, ‘What must industry do to prevent a broad social backlash?’ The answer is very simple: just stop talking about philanthropy and start talking about taxes. Taxes, taxes,” he said. “Just two days ago there was a billionaire in here — Michael Dell — and he asked a question like, ‘Name me one country where a top marginal tax rate of 70 per cent has actually worked’. “I’m a historian. The United States. That’s where it has actually worked, in the 1950s during Republican president Eisenhower, the war veteran, the top marginal tax rate in the US was 91 per cent for people like Michael Dell. The top estate tax for people like Michael Dell was more than 70 per cent. “This is not rocket science. We can talk for a very long time about all these stupid philanthropy schemes, we can invite Bono once more, but come on — we’ve got to be talking about taxes. But one member of the audience, former Yahoo chief financial officer Ken Goldman, challenged Mr Bregman’s comments, arguing it was a “one-sided panel” that should instead focus on what people actually wanted — “the dignity of a job”. Mr Dell spoke at a panel a few days earlier, arguing against a proposal put forward by Democrat representative Alexandria Ocasio-Cortez for a tax rate of 70 per cent for people with incomes exceeding $US10 million. He argued it “would not help the growth of the US economy”, while other panels said increasing tax was just an “easy fix” and providing education and access to technologies would be a better long-term solution to tackling inequality.